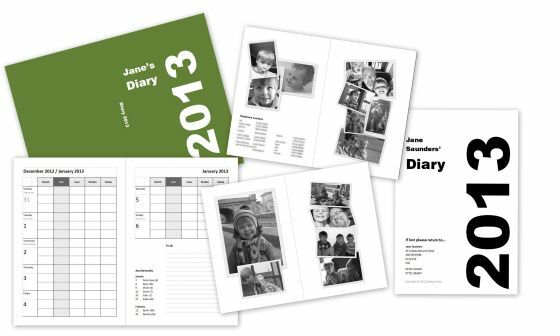 Long-time readers of this blog may remember that in December 2011 I set about creating a personalised diary for Jane for 2012. Jane wanted one that would allow her to see a week at a glance, with separate columns for each of the family members, separated into blocks for morning, afternoon and evening activities. It took us two attempts to get it right. The first version had a redundant page at the start which threw the rest of the pages out of order. The second version had a couple of typos but has been very useful, Jane reports, and has had a lot of enquiries from people wondering where she got it made. Having used the diary for a year Jane requested a couple of tweaks to the 2013 edition: move Isaac’s column next to hers, as she tends to do a lot of things with him as he’s not at playgroup or nursery quite yet; remove the shopping list from each double-page spread and widen the “to do” list; update the photos, which we sat and did last night using Google Picasa for the skewed photo-pile look. This afternoon I put the finishing touches to the 2013 diary, uploaded it to Lulu.com and ordered a copy. It should be with us in about 10-14 days’ time. I can’t wait. Thankfully, last year we had the insight to create a 13 month diary: January 2012 – January 2013, inclusive. So Jane can continue to use her existing diary until the new one arrives. Thanks Chris. Having the template from last year (I created it using Microsoft Publisher 2010 and Adobe Acrobat to create the PDFs) meant that it was really quick to update for the 2013 diary. It took me maybe five or six hours to put together.